Error: unable to create cache folder '/images/zir'. Dave Stephenson is kind of like the Big Kahuna of winemakers around Walla Walla. He’s not a very old guy but he’s been around the Walla Walla wine scene for a very long time. He’s a former surfer dude and all-around outdoors type who once had a dream of starting a brewery in Bellingham, Washington. When three other people beat him to it he took a trip across country in the early 1990s to contemplate his future. Kind of like Jack Kerouac but without the mind altering substances. After a period of “working for the man” in New York City, Dave decided grapes were his thing. Like any focused young man, he quit his job, cashed in his 401K, sold his house, sailboat and surfboard (probably in that order) and promptly moved to Walla Walla. His first vintage under his own label was in 2001 and his tiny batches of Syrah, Cabernet Sauvignon, Merlot and Viognier started getting some attention. Many of Dave’s early wines grabbed 90 plus point scores in the usual publications. But he was making such small amounts that very few people outside of Washington ever got drink his wines. 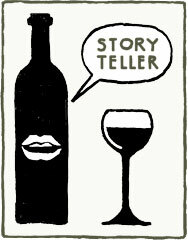 But in Walla Walla Dave is highly respected by other winemakers, many of whom seek him out for advice. Dave is also the quiet force behind the wines at Otis Kenyon and was the “on the ground” winemaker for the new darling on the Walla Walla block, Chateau Rollat. The ultimate accolade was when wine columnist Paul Gregutt, the authoritative source on Washington wines, named Dave as one of the state’s top Syrah producers. So when Dave Stephenson whips together a little red blend using his three best red wines, we should all lean in a little closer so we can hear the whisper on the streets of Walla Walla. It doesn’t sound like much, does it? But boy-oh-boy is this one smooth little customer. It is a blend comprised of 80% Syrah and 10% each of Cabernet Sauvignon and Merlot. And it’s not just any Syrah. When Paul Gregutt heaped praise on Dave in his book on Washington wines and wineries, he wrote, “Special kudos to the syrah, made with grapes from the Yakima Valley’s Willow Crest vineyard. It’s a dazzling effort, displaying elegant power. Polished red fruits with overtones of peach, apricot and candied orange are seamlessly woven into a wine that lingers sensuously in the mouth.” Sound good? Of course it does. But a bottle Stephenson Cellars Syrah, made with Willow Crest Syrah, will cost you between 32.00 and 40.00 a bottle. And believe me, it’s worth every penny. But this non-vintage red is made up of that same Willow Crest Vineyard Syrah, along with Cab and Merlot from Wooded Island and Forgotten Hills vineyards. And Dave gives the NV Red the same deluxe treatment his more expensive wines receive. The fruit, made up of grapes from the 2004 and 2005 vintages, was aged 20 months in 100% French oak. The barrels were Allier and Vosges, with 50% of them new and 50% of them a year old. And there was only enough left over from Dave’s other wines to make a miniscule 300 cases of this wine. So no wonder it’s virtually impossible to find anywhere in the United States. Dave sells most of it as a reward to those intrepid enough to actually find his winery! Luckily, I was able to convince Dave to sell some to Storyteller. As for the wine itself, let’s just say it is a heck of a value. It is everything you would expect from a Walla Walla red, with nice structure and fruit that goes on forever. The nose is packed with aromas like cedar, dusty rocks, dry hay, violets, dark plum and dark cherry. The palate is slippery and slick with all the sweet dark cherry fruit your palate can handle. And what I really appreciated was how nicely the oak and fruit are integrated. While I was drinking this wine on Saturday I never once found myself thinking about new oak influences. In addition to that dark cherry presence I did pick up a bit of what Gregutt described as peach. But maybe white peach would be closer to the mark. It’s a superbly put together wine, one that will be perfect for those fall harvest-inspired dinners. Beef stew, dark turkey meat, lamb or pork will all be great pairings with this wine. But I did save some of the bottle for Sunday and I am happy to report that it is even better on day two. On the second day the cedar became even more pronounced and the dark cherry became darker, more dominant and even dustier. Yup, there is cherry dust here. Not fairy dust, although I’m sure this wine will hold magical sway over more than a few of you. No, cherry dust. I remember the first time somebody uttered the phrase “Dusi dust” while talking about a California Zinfandel and I’ll be darned if I’m not getting a similar quality here. Overall, this is a wine I’m happy to give my highest recommendation. I can’t imagine there are too many folks out there that won’t enjoy this wine a whole lot. There were only 300 cases of the NV Red made and there are about 10-15 left. For those of you that get a six-pack, the price will be 126.00. Or you can prepare for the long winter by snagging a case of twelve bottles for 228.00. Case buyers will be hard-pressed to find a better bottle of 19.00 wine out there. Originally I don’t think Dave intended to have a blend. Which is why I love the statement he placed on the back label. “This wine as produced, stared at, liberally sampled, blended, coddled and eventually bottled by Stephenson Cellars.” Coddled I can believe and I know this wine is going to be liberally sampled around my house over the next few weeks.